I guess we all agree on the statement that Joe McPhee is a real free jazz/improvisation giant. He is a master on his instrument, he can play almost everything from Coltrane-inspired tunes to lyrical blues and he is able to let the demons loose as well. In the last few years he has played many duos with a lot of different drummers like Paul Hession, John Heward, Chris Corsano, Paal Nilssen-Love or Michael Zerang (with whom he recorded one of my last year’s favorites: Creole Gardens). On his new record, which was recorded at Lincoln Hall, Cornell University in Ithaca, New York, he has teamed up with Eli Keszler, a young outstanding drummer and sound sculptor, who is – frankly speaking - the real sensation here. Keszler starts the set with an almost bumpy pattern before McPhee falls in with a long mournful cry sounding like a muezzin calling for prayer. One of the concert’s characteristics is that it is a constant up and down, there are alternating beautiful soaring passages and almost silent moments, which are all of a sudden replaced by wild rides. 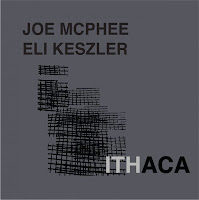 On his part, Keszler takes the load off from McPhee, no matter if he is playing hectic crazy rhythms or if he is creating fragile sounds. He is contrasting McPhee’s beautiful melodies with rolling drums or minimal patterns, forcing him to give up his beautiful, often eastern inspired lines in order to battle with him again. Silence, speed competitions, and wild outbreaks perfectly balance each other here, it is improvised music in its literal sense. The b-side of the album is the more beautiful one, starting almost shy, tender, timid, as if the two were hesitating to dance with each other again. McPhee is very cautious and lyrical while Keszler is rolling silently with his brushes before he starts using a bow on the cymbals which makes them sound like a musical saw. He did that in the first part as well but there the sounds were incredibly shrill, almost unbearable. Here they are of the utmost beauty, it is like watching crystal snowflakes falling from the sky in a winter night. A moment that could last forever – but Keszler stops abruptly. McPhee then drops in playing a bebop melody and Keszler seems to jolt behind him in the background. Unlike the first part McPhee is pushing Keszler now, who is almost losing his breath playing single beats on drums and cymbals before they ride into the dark again together, where the sets stops out of the blue. Of course the two combine tradition and new ideas, that is what makes this record so fascinating. McPhee uses all his skills and Keszler covers him no matter which way he goes. Unfortunately, the record is limited to 250 copies only, it is pressed on 140 g vinyl and has a great voluminous sound. There are still copies available on the internet but you better be quick.